A truck backrack is a baffle, or wall-like structure, that protects the driver during a sudden stop. The specific placement of backrack depends on the type of truck. For example, the backrack on a pickup truck is typically installed directly behind the cab. A flatbed trailer usually has the backrack at the front of the trailer or the rear of the tractor. The most common design for a backrack is a vertical frame made of metal. Its traditional purpose is to keep cargo in the bed from going through the cab’s rear window and striking the occupants in the event of a front-end collision. Modern backracks are also used to hang various pieces of equipment, especially for commercial vehicles. Backracks have traditionally been constructed of steel, although aluminum backracks have become more popular since their entry into the market in 2000. Aluminum offers several advantages over steel, including its lighter weight and greater resistance to corrosion. Many types of backracks can be easily installed without the need for specialized skills or tools. Magnum backracks are constructed entirely of aluminum using metal inert gas (MIG) and tungsten inert gas (TIG) welding techniques. The aluminum pieces are also finished with a powder coat for additional protection. 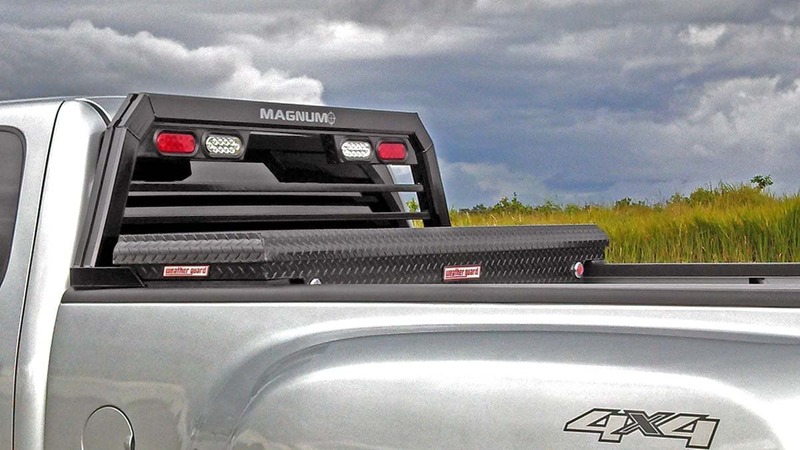 Each Magnum backrack has a precision fit to a specific model of truck, making them the best-fitting racks available. The kits for these backracks also include an accessory track that makes them compatible with Magnum’s full line of backrack accessories. This feature allows these backracks to be customized for a particular cargo or task. Steel is primarily composed of iron, which is vulnerable to rust. Aluminum doesn’t rust and is generally more resistant to other types of corrosion than steel. The manufacturers of steel backracks must implement additional protective measures against rust, which increase the price of the backrack. Stainless steel has greater rust resistance, although it’s generally not as strong as other types of steel. Steel backracks may also be coated with a layer of zinc to protect it from corrosion, but this layer will eventually wear off over time. Pure aluminum weighs about one-third as much as a typical grade of steel. However, aluminum backracks are made of aluminum alloys that contain small concentrations of other metals. These alloys are stronger than pure aluminum, with the net result being that an aluminum backrack may weigh up to 15 percent less than a steel backrack of similar strength. This weight difference may be added directly onto the truck’s cargo capacity, which increases the truck’s operating efficiency. Magnum backracks have been specifically designed to withstand high stress over a long period time, especially for work trucks. Magnum backracks are available in four basic profiles. In increasing order of height, they are the Service Body, Low-Pro, Standard and High-Pro profiles. Common variations on these basic styles include lights and a cut-out that allows passengers to look out of the cab’s rear window without obstructions. The Service Body profile is primarily used for cosmetic purposes. The Low-Pro profile can perform demanding tasks and handle harsh weather while providing an attractive appearance. The Standard profile strikes a balance between appearance and functionality, and will typically be the best choice for most truck owners. The High Pro profile is for owners who need more functionality than the average owner by providing more room for attaching equipment. This profile is also ideal for professional contractors who need a backrack with a rugged, modern design. Magnum backracks are easy to install with standard tools. They are attached to the truck with bolts or stakes and pockets. 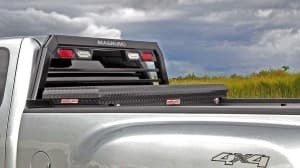 These backracks can also be installed on trucks with an inside the rails tonneau cover, which is a hard or soft cover over the bed of a pickup truck. Soft tonneau covers roll up and down, while hard covers have a folding or hinging mechanism. The kits for Magnum backracks include fully-function backup lights, brake lights and a wire harness. Magnum backracks are manufactured entirely in America at our manufacturing facility in Maine. We’re committed to providing our customers with the best equipment available, made by American workers with pride. Our corporate address is 485 Belfast Augusta Rd, Liberty, Maine.